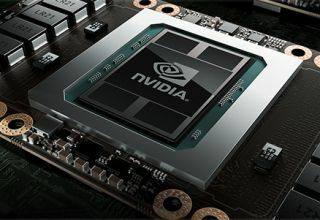 We already know that Nvidia's Pascal architecture packs a pretty mean punch on the desktop, but will the same be true of its mobile variants? Leaked specs of two mobile Pascal GPUs, the GeForce GTX 1070 and GeForce GTX 1060, suggest they will be as well. The folks at Videocardz.com scraped the web for information about Nvidia's mobile plans and found information from a few different sources. One of them posted a GPU-Z screenshot of a GeForce GTX 1070 inside of a laptop. If it's legit, it looks as though Nvidia will reach performance parity between its mobile and desktop GTX 1070 GPUs by playing with the CUDA core count and clockspeeds. Specifically, the screenshot shows the mobile GTX 1070 with 2,048 CUDA cores, compared to 1,920 on the desktop variant. However, it's clocked slower with base/boost clocks of 1,443MHz/1,645MHz versus 1,506MHz/1,683MHz. Both versions have 8GB of GDDR5 memory pumping data through a 256-bit bus. Another leak shows what it claims is the first picture of a mobile Pascal part in a standard MXM form-factor. It appears to have a 4+2 power phase design with a connector added to draw additional power. That means it's pulling more than 100W. While the mobile version of the GTX 1070 balances performance with the desktop variant by adding more cores and lowering clockspeeds, the GTX 1060 in mobile form keeps the core count the same as the desktop version with 1,280 CUDA cores, but runs slower with base/boost clocks of 1,405MHz/1,671MHz, versus instead of 1,506MHz/1,708MHz. We should know more next week as it's rumored Nvidia will formally launch Pascal in mobile form at Gamescom 2016, which is scheduled for August 16.